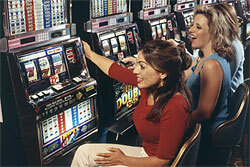 When classifying the slots according to the regional slots variations, it is wise to mention USA slots type. This kind of slots is said to be really advanced and easy to play as compared with the other countries. It is widely accepted that the USA is considered to be the motherland of the slots and Fey their father. However, this type of gambling games made its way far into the other parts of the globe and is still recognizable. The history of slots popularity can be traced back into the 1930s. However, it is essential to mention that 1980s were great times for the Slots in the USA. It was the period in the slots history, when they managed to become much more profitable in comparison with the table games. It is essential to know that the Australian Aristocrat Company managed to develop the first Australian slots called the Clubman in the 1950s. However, two years after they improved the previous version with more advanced and improved slots and called it the Club master. However, in Australia it was widely accepted that the priority of slot machine foundation belonged to the USA and namely to Charles Fey. The United Kingdom is not an exceptional state in relation to the slots popularity. In GB, the slots machine provision is ruled by the Gambling Act affirmed in 2005. The Act was constructed taking into consideration of the previous variant that was released in 1968. Thus, the gambling establishments under the provisions of the letter document were allowed to use some particular categories of the slots. Thus, slots in UK are tending to be divided into the groups: A, B, C, according to the current legislation. Japanese slots are better recognizable under the name pachinko, pachisuro or pachislo. On the Japan territory slot machines are to be known to be ultimately new stuff and can be found in the parlors for pachinko and the adults sections in amusement arcades also known to be the gaming centers.